Apparently, Goldman Sachs is doing God's work after all. 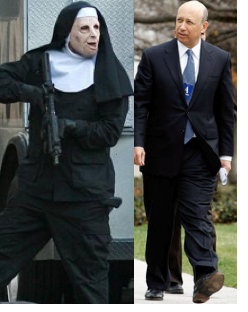 However, several Catholic nuns believe the bank's chief executive angel, a.k.a. "Holy" Lloyd Blankfein, is not worth $19 million a year. Four orders of nuns with significant equity stakes in Goldman are up in arms after the bank filed its 2010 earnings report, revealing that Blankfein made a cash bonus of $5.1 million plus another $14 million in salary, stock, and benefits. As a result, the Sisters of St. Joseph of Boston, the Sisters of Notre Dame de Namur, the Sisters of St. Francis of Philadelphia, and the Benedictine Sisters of Mt. Angel have demanded that Goldman provide them with a subsequent report about why the heck the bank's CEO made all that dough while its profit actually shrank versus what it booked in 2009. They also want to know how Goldman's top five divine messengers (including Lloyd) managed to earn a total of $69.5 million. 1. An evaluation of whether senior executive compensation packages (including, but not limited to, options, benefits, perks, loans and retirement agreements) are 'excessive' and should be modified. 2. An exploration of how sizeable layoffs and the level of pay of lowest paid workers impact senior executive pay. 3. An analysis of the way in which fluctuations in revenues impact: a) the company's compensation pool; b) the compensation of the company's top 25 senior executives; and c) the company's shareholders. So, will Lloyd provide the sisters with the additional report? Goldman's resonse to the sisters' request was this: "Shareholders already have access to the information necessary to understand and assess the compensation decisions made with respect to our senior executives ... the preparation of the requested report would be a distraction to our compensation committee ... and would not provide shareholders with any meaningful information." In other words, the nuns can get lo$t.